Maximum commission for the paid order is $50. Pay attention that the settings of the program has been updated.Now you are be able to track the number of actual orders quicker and to predict the commission amount more precisely. Details: Another purpose was added to the program- "Completed order". At first all orders get on purpose "Paid order" with the date of order placement and the commission size amount as well. When the advertiser finalizes the statuses of these leads, they are duplicated on the second purpose "Completed order" and contain the equivalent duplicates of the placed orders with actual date of their final status, including the commission for payment. After that, all commissions of orders on the purpose "Paid order" will be nullified. 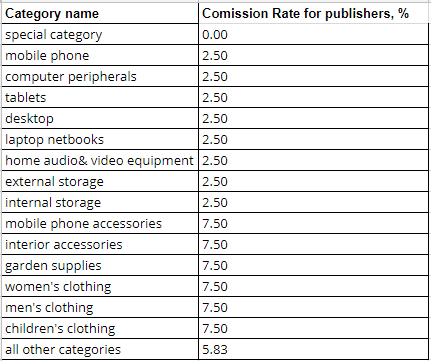 *Dear publishers please pay attention that average processing period makes 60 days (during this period orders get the final status). But in extraordinary cases processing period can be increased on the side of advertiser. Attention! Pay attention that from the 1st of June, 2016 the prohibition of purchase of the brand words of AliExpress or any related words by means of Search Engine Marketing (SEM) or other means come into force. In case of violation detection the partner won't get any payment for the successful leads for month the violation was detected. If you have additional partner programs to avoid a double penalty, we recommendyou to adjust SID. No more non-affiliate goods (all goods will be fully paid). Post click is increased to 3 days. Changes in categoies and comissions (please check offer description. Some corrections in comissions (positive ones). New promotions and banners added. 27/03/2018, 17:01 Attention! Big sale in AliExpress offer. 28th of march, global Anniversary Sale starts. Also added are permanent promotions (including landings and banners) - All Under $5 and Quick deals. Added a new Lowcoster landing (only for mobile traffic), with really the lowest prices for goods. 22/01/2018, 13:09 Attention! Conditions changed in AliExpress offer. Comissions are updated for all categories. Please, check details in the offer description. 12/01/2018, 16:13 New promotion from offer "AliExpress". AliExpress added new banners and landing. Please go ahead and have a nice work! Landings and banners were added. 11.11 sale banners and landing were added. 24/10/2017, 19:51 Attention! Conditions improved in AliExpress offer. New comission is now from 2.1% to 10.1% for Completed order. Also, Incentive scale is back. Please, check details in the offer description. Technical works are happening on advertiser's side, related to the coming conditions changes. due to this, the commission for some actions may not be displayed correctly and will be corrected later. All problematic actions will be taken into account and correctly recounted. After the end of the technical works, we will inform you about the final changes in conditions. 04/10/2017, 18:53 Attention! Now AliExpress offer can track orders from Tmall platform. For your convenience, we added the ability to track orders from the Tmall platform. Details provided in the offer description. Dear partners, we regret to inform you that from August 10th there will be a change in conditions in Aliexpress offer. The advertiser reduces the rates and cancels the bonus scale. The new terms apply to orders placed from August 10. Any previously completed order will be subject to the old conditions of remuneration and bonus calculation. From 1st of June 2017 new commission rates on category and geo split are being effective. Details are in the description of the program. 28/03/2017, 16:34 NEW PROMOTION IN "AliExpress"! 28.03.2017 - 30.03.2017 7TH ANNIVERSARY SALE! In offer added new Banners. Please use them at work! 11/11/2016, 09:26 New promotion from offer "AliExpress". Only 11/11/2016 Global shopping 11.11! Up to 50% off! 03/11/2016, 16:30 Attention!Condition improve in "Aliexpress" program! Processing period is reduced to 60 days, and also catalogues of goods are added in the program. You can use in your work. Details in the program. 02/11/2016, 13:03 Attention! "Aliexpress" program has added the changes with the aims' adjustments. Details please find in the program description. 07/10/2016, 11:48 Technical issues with offer "Aliexpress". Dear publishers! In offer "Aliexpress" there has been delay with verification process and suspension of exit from hold is temporary set.The delay is caused by technical works on the side of the advertiser. Soon statistics will be verified and suspension of exit from hold will be disconnected. Approximate term - until of 14/10/2016. 26/05/2016, 21:03 Dear publishers! From 26/05/2016 there is change in "Aliexpress" offer! Dear publishers! From 26/05/2016 in "Aliexpress" offer there is change regarding the purpose, From 26/05/2016 leads will be valid on the purpose id №7655 "Paid order New". Purpose №4786 "Paid order" will be active temporary untill the processing period is over. Pay attention please that this does NOT require from you any additional actions. Wish you high conversion! 25/11/2015, 11:32 New action from offer «AliExpress». To 30/11/2015 Black Friday & Cyber Monday! Up to 70% off. In offer added new banners. Please use them at work. 15/10/2015, 17:48 Offer «AliExpress» Top products added. In offer added bestselling products global and bestselling products russia. Please use them at work. 19/08/2015, 18:14 New promotion from offer "AliExpress". In offer added new Actions, Landings and Banners. Please use them at work. 17/07/2015, 12:25 New action from offer «AliExpress». To 31/07/2015 72 hours delivery to Spain. BIG SUMMER SALE! In offer added new banners. Please use them at work. 10/07/2015, 16:22 New promotion from offer "AliExpress". 02/07/2015, 13:16 New promotion from offer "AliExpress". In offer added new Landings and Banners. Please use them at work. 25/06/2015, 11:12 New action from offer «AliExpress» for Indonesia. To 31/07/2015 Bang Ali Big Sale! See section Promotions. In offer added new banners. Please use them at work. Novas landings foram adicionadas a campanha Aliexpress Brasil. Por favor, promovam essas páginas uma vez que incluem um elevado número de produtos atrativos, assim você poderá maximizar suas comissões. Além disso, elas listam os melhores produtos da AliExpress, com taxas de conversão muito boa. Utilize estes materiais para impulsionar as vendas. 28/05/2015, 10:42 New action from offer «AliExpress». There will be a 24-hour sale on May 28th for the brand Li-ning. Super Sale Arc IV Cushion Running Shoes + coupon 3$ + Free shipping! Please use them at work. 20/05/2015, 12:17 New promo from offer "AliExpress". In offer added new Landing, Banners and Actions. Please use them at work. 14/04/2015, 11:25 New promotion materials for offer "AliExpress". In offer added new Landings, Banners and Actions. Please use them at work. 02/04/2015, 15:58 New action from offer «AliExpress». 01.04.2015 - 17.04.2015 5th anniversary new arrival! Check the details in "Actions" section. New banners were added. 25/03/2015, 11:24 New action from offer «AliExpress». 24.03.2015 - 31.03.2015 Aliexpress 5th Anniversary Sale! Check the details in "Actions" section. New banners were added. 12/03/2015, 14:01 We remind you about the rules of working with offer "AliExpress". It is forbidden to generate traffic directly to the advertiser's site from sources using Popup, Clickunder / Popunder, AdSpot / RichMedia / Sliding formats, you must use the through pages! When a fault is detected source will be blocked and fined. 11/03/2015, 11:38 New action from offer «AliExpress». 11.03.2015 - 22.03.2015 12 days of tech sale! Exclusive Discounts! Check the details in "Actions" section. New banners were added. 10/03/2015, 11:26 New promotional materials from "AliExpress". In offer added new banners and Landing. Have a nice work! 18/02/2015, 10:52 New action from offer «AliExpress». 18.02.2015 - 02.03.2015 70% OFF on exclusive fashion collection in Turkey! Check the details in "Actions" section. New banners were added. 13/02/2015, 12:00 New action from offer «AliExpress». From 13/02/2015 to 28/02/2015 Chinese New Year Sale! Check the details in "Actions" section. Also offer added new promotional banners. 11/02/2015, 16:34 Attention! Change in the conditions of the offer "AliExpress". Due to the holidays in China will be temporarily increased Hold. Hold the maximum 85 days. 06/02/2015, 12:13 New action from offer «AliExpress». 6 – 16 February 2015 Group Buy : Buy More Get More Discount! Check the details in "Actions" section. New banners were added. 05/02/2015, 11:29 New action from offer «AliExpress». 02 February -14 February 2014 Automotive Sale! Check the details in "Actions" section. New banners were added.